Welcome to SitcomsOnline Digest! It hasn't been an incredibly busy week this week, but we do have news of the end of a CBS series (that wasn't completely unexpected), a preview of the next season of Unbreakable Kimmy Schmidt, and news of new Family Matters DVDs. Let's get going! It looks like Warner Archive is planning to push Family Matters to completion as quickly as possible, as TVShowsOnDVD.com discovered this week that the sixth season will arrive on DVD on April 12. 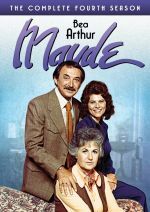 Maude - The Complete Fourth Season (DVD, $26.99): Shout! Factory continues the All in the Family spinoff on DVD with this release. Who to Follow: Rider Strong (Twitter), "Actor. Now director. Sometimes author. Whatever: I make believe for a living." Claim to Fame: Rider Strong got his start on television in guest roles on series such as Home Improvement, Evening Shade, Empty Nest, and Nurses, as well as a recurring voice on Bobby's World, but it goes without saying that his best known role is that of Shawn Hunter, which he played on the series Boy Meets World. Since then, he has gotten more involved with the independent film scene (rather successfully, it seems), though he did appear on the short-lived WB series Pepper Dennis, and has made appearances on Girl Meets World.